^ "Age of the Earth". U.S. Geological Survey. 1997. Archived from the original on 23 December 2005. Retrieved 2006-01-10. ^ Hutton, James (2013). "Theory of the Earth; or an investigation of the laws observable in the composition, dissolution, and restoration of land upon the Globe". Transactions of the Royal Society of Edinburgh (published 1788). 1 (2): 209–308. doi:10.1017/s0080456800029227. Retrieved 2016-09-06. ^ "Anthropocene: Age of Man – Pictures, More From National Geographic Magazine". ngm.nationalgeographic.com. Retrieved 2015-09-22. ^ Stromberg, Joseph. "What is the Anthropocene and Are We in It?". Retrieved 2015-09-22. ^ George Dvorsky. "New Evidence Suggests Human Beings Are a Geological Force of Nature". Gizmodo.com. Retrieved 2016-10-15. ^ "Geologic Timescale Elements in the International Chronostratigraphic Chart". Retrieved 2014-08-03. ^ Cox, Simon J. D. "SPARQL endpoint for CGI timescale service". Archived from the original on 2014-08-06. Retrieved 2014-08-03. 2-forced climate thresholds during the Phanerozoic" (PDF). Geochimica et Cosmochimica Acta. 70 (23): 5665–75. Bibcode:2006GeCoA..70.5665R. doi:10.1016/j.gca.2005.11.031. ^ a b c d e f g h i j k l m n Van Kranendonk, Martin J. (2012). "16: A Chronostratigraphic Division of the Precambrian: Possibilities and Challenges". In Felix M. Gradstein; James G. Ogg; Mark D. Schmitz; abi M. Ogg. 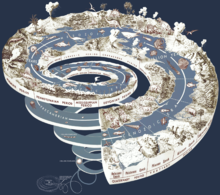 The geologic time scale 2012 (1st ed.). Amsterdam: Elsevier. pp. 359–365. ISBN 978-0-44-459425-9.